In its fifth year of existence, Africa’s biggest music platform — Coke Studio Africa — has achieved a key milestone in driving digital consumer interaction. 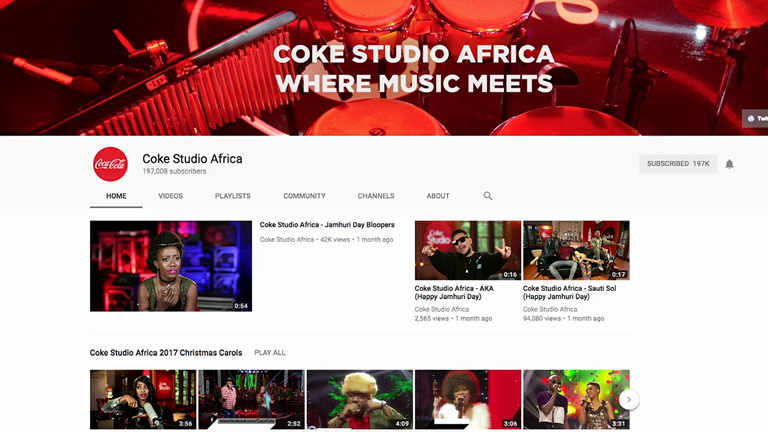 The Coke Studio Africa YouTube channel has received the YouTube Silver Creator Award in recognition of its achievement of more than 100,000 subscribers on the channel. The role of Coke Studio Africa’s YouTube channel has been to extend the TV reach of the show by providing audiences with music content on demand. As such, the channel actively managed to distribute music content across Africa and beyond, with over 90 million views from South Africa, Nigeria, Kenya, Ghana, and as far as USA, United Kingdom, United Arab Emirates amounting to 179,527,578 minutes of watch time. This award comes as a validation of Coca-Cola’s continuous efforts to embrace the digital evolution. Receiving the recognition from YouTube is indeed an honour and an inspiration for other content creators on the continent to engage audiences on the digital space. Coke Studio aims to inspire and introduce Africa’s music talents to a new and wider audience through interaction, collaboration, and cooperation amongst musical artists while also building a strong brand connection with Africa’s young and growing population who are rapidly joining the ranks of digital natives. Several successful collaborations between African artists have been born through Coke Studio. The Coke Studio Africa original hit single “SAID” featuring Nasty C (South Africa) and Runtown (Nigeria), and produced by Shado Chris (Ivory Coast), is one of these successes. This collaborated track reached over two million views on YouTube in just a few weeks.